Sicily is one of earth's most spectacular and interesting islands. Settled by Greeks, Romans, Arabs, Normans, Carthaginians and many others, with rugged mountains dominated by Mount Etna, Europe's most active large volcano, some ancient towns and a fantastic tradition of cuisine influenced by the many invaders there is more than enough to spoil your senses. This is a relatively active cruise with a great variety of experiences available to you. Walking on volcanoes, exploring the street food of Palermo, watching the sunset across the salt pans of Trapani, ascending to the Norman fortress of Cefalu for a picnic of local produce, and exploring Palermo, the amazing capital. Towering nearly 11000 feet above sea level, Etna dominates the landscape of Eastern Sicily and clad with some fine vineyards. A hidden gem on the north coast, an old traditional fishing town dominated by a huge rock topped with a Norman fortress. Trapani is a small fishing port and Erice sits atop 2500 foot high hill with views across to Africa on a clear day. The nearby salt flats are a nature reserve and a great spot to watch the sunset as the different salt content reflects different colours. Stromboli is an active volcano that rises nearly 1000 metres from the sea and is usually in a state of constant but mild activity. Set high up on a ridge with views down the coast and across to Etna, Taormina's is famous for its ancient and well preserved theatre. Apart from the cathedral, Palermo's markets display a vast array of local produce - We will explore the markets and then learn what to do with the produce. Unusually you have the choice of eating on board, enjoying the meals and food provided during your excursions, or trying some of the restaurants ashore (at your own expense). The ship will provide full board if required (breakfast, lunch (3 courses), dinner (3 courses), glass of wine (house red or white) or beer, or soft drink during lunch and dinner, water, afternoon coffee or tea with a snack. All cabins offer central A/C and ventilation, a mini-bar, flat screen satellite TV, phone system, and hairdryer. Cabins on the Camille Deck feature two oversized portholes. All cabins offer central A/C and ventilation, windows, a mini-bar, flat screen satellite TV, phone system, and hairdryer. .
All cabins offer central A/C and ventilation, a mini-bar, flat screen satellite TV, phone system, and hairdryer. Cabins on the Lumiere Deck have large windows. All cabins offer central A/C and ventilation, a mini-bar, flat screen satellite TV, phone system, and hairdryer. All cabins offer central A/C and ventilation, windows, a mini-bar, flat screen satellite TV, phone system, and hairdryer. We will embark in MS Monet in Valletta Harbour and dinner will be served on board. You can embark anytime between 12.00 - 17.00. We will sail overnight to Sicily. Arrive early in Siracusa. Visit Noto, the centre of Sicilian Baroque architecture, a treasure chest brimming with baroque churches and palaces. We will visit the ‘Invisible Winery’ set among a spectacular landscape and indulge in a little wine tasting and take lunch. A short guided tour of the beautiful old city of Siracusa with time to wander the tiny streets, visit some of the historical sites or just enjoy the views and a coffee. Sail to Giardi Naxos overnight. Docking in Giardi Naxos, the gateway to Mt Etna and beautiful Taormina. You will have plenty of time for strolling the streets to admire the ancient churches, glamorous shops and unusual decorations, and taking a coffee in the square. A visit to Mount Etna and the Refugio Sapienza (Eruptions permitting!) the chance to walk round 1-2 of the craters. Film buffs can visit the 'Godfather villa' which is actually an 18th century villa, - the Castello degli Schiavi situated on the eastern slopes of Mount Etna. Lunch will be based on Etna’s local cuisine paired with their wines. Dinner onboard. Overnight sailing to Stromboli. Arriving early morning in Panarea you will have a few hours to explore this very beautiful island. With a population of fewer than 300 people it is the second smallest Aeolian Island and is the remains of an extinct volcano. We then sail on to one of the most active volcanoes in the world, Stromboli. You now have some free time and to view the eruptions during the evening from our vessel. Dinner on board. Day 5. Cefalu - Beautiful and something a bit different. Cefalu is lesser known than many other sites in Sicily, this beautiful old coastal town is set against the backdrop of a towering rock topped off by a norman fortress. The highlight for those who wish to join, will be a picnic served in the Norman fortress, a thirty minute walk up the hill from the town. With a guided walk around and up the towering slopes of the "Rocca" with our guide - a great vantage spot to study the story of Cefalù and a fine spot for a picnic. This spot provides a fine panorama from where you can take photos of the labyrinthine city. If you would rather stay in the town there are plenty of options with narrow streets, fine beaches, blue sea, ancient washing pools and glorious cathedral. After lunch we will head back into the old town for a refreshing granita or drink while relaxing in the Duomo square in front of the Unesco monument. Dinner on board, Leaving port in the evening to cruise overnight to Trapani on Sicily's west coast. Docking in Trapani, a small but active fishing village with cafes overlooking the harbour. Join the excursion to the ancient town of Erice set spectacularly 2500 feet above sea level, from where you can see Africa on a clear day! Erice is famous in antiquity for its temples and claims to be the best preserved mediaeval town in the world, rich in castles and churches. Learn about the tradition of dolci Siciliani at a historical pastry shop, made by nuns and sample their wares before we enjoy a typical lunch in an olive oil farm under the olive trees, followed by an olive oil tasting. We make a short stop at a famous winery to look at the various methods of bottling. This evening we visit the salt pans at Marsala, and the nearby nature reserve important for migrating birds. Visiting at dusk we can watch the sun going down across the flats, with the right conditions, the sunset will be reflected in a variety of colours depending on the salt content of the pools. We will wake up in Palermo, the spectacular and slightly mad capital of Sicily. The morning has a special walking tour of Palermo dedicated to “Street food”. A 3 hour walking tour where you will sample the best of Sicily’s street food, led by a local expert guide, you will explore the fascinating culinary world of Sicily’s Capital. A local chef will take us on an adventure exploring historic markets in Palermo (Il Capo) where we will purchase the ingredients necessary to prepare our lunch. Once we have enjoyed the vast array of produce we learn what to do with it. Our chef will host a hands-on cooking class in a typical restaurant followed by lunch. The dishes you've prepared will be served with just the right Sicilian wine, and dessert accompanied by local biscotti and Sicilian dessert wine. In the afternoon join the guided tour of Palermo - the quintessence of Sicily. There will still be time to relax before we head back to the ship for our last evening. You may have your evening meal on aboard the Monet or if you prefer try one of the many fine restaurants in Palermo. After a final night on board we will have breakfast and disembark in Palermo. Optional excursion to The Valley of The Temples. Optional Excursion to The Valley of the Temples: A day tour to Agrigento and the Valley Of The Temples. Join this private tour to the beautiful Valley of the temples guided by our local specialist. The numerous archaeological ruins of the Greek period were visited and narrated by Goethe in his work “Viaggio in Italia”. The most spectacular structure is the Concordia temple. Enjoy a lunchtime picnic at the Kolymbetra Park with its fruit trees from every part of the world, some of which are over 1000 years old! Surrounded by pomegranate, pistachio, orange and lemon trees you will enjoy a typical Sicilian lunch served to you outdoors, complete with local fruit, cheese and wine. This is sure to be another highlight of your trip. Return to Palermo after lunch. After a final night on board we will have breakfast and disembark in Palermo. Optional Excursion to The Valley of the Temples Alternatively you can join an optional day tour to Agrigento and the Valley Of The Temples. We will visit the beautiful Valley of the temples on a private guided tour, with a local specialist guide. The archaeological ruins of the Greek period are numerous and they were visited and narrated by Goethe in his work “ Viaggio in Italia”. In the middle of the valley the most spectacular structure is the Concordia temple. We will have a lunchtime picnic lunch at the Kolymbetra Park. This Garden has fruit trees from every part of the world and some of the trees are over 1000 years old! Then surrounded by pomegranate, pistachio, orange and lemon trees you will enjoy a typical Sicilian lunch served to you outdoors, complete with local fruit, cheese and wine. This is sure to be another highlight of your trip. After lunch we will return to Palermo. We will wake up in Palermo, the spectacular and slightly mad capital of Sicily. Cars, vans and thousands of scooters vie for space in the narrow streets, horns blaring, while trying to force themselves into seemingly impossible gaps. We will start the day by meeting a local chef who will take us on an adventure exploring one of Palermo’s historic markets (Il Capo) where you will purchase all the ingredients necessary to prepare your lunch. We will visit the covered market to see a vast array of fresh produce and local delicacies. The morning will be spent with a special walking tour of Palermo dedicated to “Street food”. A 3 hour walking tour where you will sample the best of Sicily’s street food, led by a local expert guide, you will explore the fascinating culinary world of Sicily’s Capital. You will visit the famous and bustling Mercato del Capo, ourdoor markets, tasting five different Sicilian treats along the way – including “panelle” (chickpea fritters) and arancine (deep- fried rice balls). Once we have enjoyed the vast array of produce we have the opportunity to learn what to do with it. Our chef will host a hands-on cooking class in a typical restaurant followed by lunch. The dishes you've prepared will be served with just the right Sicilian wine, and dessert accompanied by local biscotti and Sicilian dessert wine. Afterwards, for those that can still move, you can enjoy a tour of Palermo - the quintessence of Sicily, capable of being chaotic, elegant, fascinating, secretive and a little decadent, all at the same time. In the small streets and alleys of its huge historic centre, elegant Baroque and Norman monuments stand side-by-side with Arabic domes. A visit to the city’s numerous and famous monuments, churches, squares, cathedrals, villas and aristocratic residences is a absolute must: Don’t miss the Cathedral, the Palazzo Reale, the Cappella Palatina, San Giovanni degli Eremiti, the 12th – century Normal churches of San Cataldo and la Martorana, behind the magnificent Piazza Pretoria. There will still be time to relax before we head back to the ship for the last evening. An evening meal will beprovided aboard the Monet but you are also free to try one of the many fine restauarnts in Palermo. We will dock in Trapani, a small but active fishing village with a few cafes overlooking the harbour. From Trapani we will take an excursion to Erice set spectacularly 2500 feet above sea level, from where you can see Africa on a clear day! This ancient town was taken over by the Normans in the 12th Century and heavily fortified. In the evening we will visit the Salt Pans at Marsala, and the nearby nature reserve. These salt flats are an important site for migrating birds but we aim to visit at dusk where we will watch the sun going down across the flats. With the right conditions the sun reflects on the flats and they reflect the sunset in a variety of colours depending on the salt content of the pools. After breakfast we will head to Erice, famous in antiquity for its temples where the Phoenicians worshipped Astarte, the Greeks venerated Aphrodite and the Romans celebrated Venus. Erice claims to be the best preserved mediaeval town in the world, rich of castles and churches. Enjoy a breathtaking view from the hilltop from where you might glimpse the distant shores of Africa. We will have time to stop in a historical pastry shop in Erice to learn about the tradition of dolci Siciliani, made by nuns and we will have to sample their wares. We will enjoy a typical Lunch in a olive oil farm under the olive trees, followed by an olive-oil tasting. We make a short sop at another famous winery to look at the various methods of bottling. In the late afternoon we will visit something completely different - The coast from Marsala to Trapani is characterized an unusual and striking landscape peculiar to this part of Sicily: the saltworks. Large mirrors of saltwater form an irregular and multicoloured chessboard, dotted with windmills which were once used to pump water and grind the salt. We will stop at the Stagnone Nature Reserve, home to flamingos, for a sunset Aperitif overlooking the salt-pans - A very charming place and especially at sunset with colours that shift from red to orange to pink, encircling the ancient mills and the silhouettes of the off-shore Egadi Islands. Day 4. Cefalu - Beautiful and something a bit different. Cefalu is a surprise to many. Lesser known than many other sites in Sicily, this beautiful old coastal town set against the backdrop of a towering rock topped off by a norman fortress. The narrow streets lead to some fine beaches, the ancient washing pools where the ladies of the town would wash clothes a thousand years ago, and a glorious cathedral. We will anchor in the new harbour a 10 minute walk from the old town, and the highlight will be a picnic served in the Norman fortress, a thirty minute walk up the hill from the town. There are plenty of options if you would rather stay in the town. After breakfast on the ship we will spend the day exploring this beautiful little town. Cefalù is famous for its rich historical centre including the The Norman Cathedral and the medieval quarter, as well as for its beach and blue sea. You can explore the city in an unusual way known as "the invisible city".. Those wanting to join in will be divided into small teams and each team will be given an instant camera and a booklet, including a map. Each team will have to take photos of certain points of interest, some easy to find and and others more difficult. You will discover a city with different "eyes" and you will (hopefully) visit The Norman Duomo, started in the time of Roger II in 1131, that preserves precious mosaics which adorn the apse and a renowned and striking image of Christ. You will also visit the jewish ghetto, the ancient Postierla gate built into Megalithic walls and the the striking mediaeval wash-house . For many the highlight of the day will be a guided walk around and up the towering slopes of the "Rocca" with our guide - a great vantage spot to study the story of Cefalù and a fine spot for a picnic. This spot provides a fine panorama from where you can take wonderful photos of the labyrinthine city. After lunch we will head back into the old town for a refreshing granita or drink while relaxing in the Duomo square in front of the Unesco monument. Dinner will be provided on board and we will leave Cefalu in the evening and cruise overnight to Trapani on Sicily's west coast. We will arrive in Panarea early in the morning. Panarea is the remains of an extinct volcano and the second smallest of the Aeolian Islands, with a population of fewer than 300 people, but it comes alive in summer. It is a beautiful little island and we will stop here to explore and try the cafes. We will then continue to Stromboli for a couple of hours free time and to view the eruptions during the evening from our vessel. Stromboli is an active volcano that rises nearly 1000 metres from the sea and is usually in a state of constant but mild activity. There are three small villages on Stromboli but very few facilities. Stromboli is one of the most active volcanoes in the world, with 2-3 mini eruptions every hour, ejecting ash, rocks and some lava. We will dock in Giardi Naxos for a busy day - Giardi Naxos is the gateway to Mt Etna and beautiful Taormina. Taormina is set atop a steep hill with views down the coast and across to Mount Etna. The ancient theatre, that dates back to the Greeks and Romans, is dramatically set on the edge of the steep hill. There will be plenty of time for strolling the streets to admire the ancient churches, glamorous shops and unusual decorations, and taking a coffee in the square. For film buffs, we will visit the 'Godfather villa' which is actually an 18th century villa, - the Castello degli Schiavi situated on the eastern slopes of Mount Etna. We head to Mount Etna to the Refugio Sapienza (Eruptions permitting!) situated at over 6000 feet above sea level on the slopes of Mt Etna. There are fantastic views, a chance to walk round 1-2 of the craters and a couple of restaurants and cafes with panoramic views. We start our day on the slopes of Mt Etna with a quick visit to a local family honey farm where it is possible to taste a selection of local honey (orange, lemon, eucalyptus), as well as almond pastries, olives and olive oil. We’ll continue to a wine estate situated on Etna’s slopes some 700 metres above sea level. These lands have belonged to the same family and since 1727 they provide some fine wines. This small and elegant vineyard, nestled among forests and historic vineyards, allows visitors to discover the hospitality and cuisine of Sicily. We will enjoy a guided visit and a lunch based on Etna’s local cuisine paired with their wines In the afternoon we will stop at Fiumefreddo visit to the 'Godfather Villa, the “Castello degli Schiavi”, the house of Don Corleone. This beautiful residence was built in 1700 as a country house for the Nobility. The house was location for several scenes throughout the Godfather films including the unintentional murder of Apollonia in the Godfather and also the brutal revenge Killing of Don Ciccio, by Vito Corleone in Godfather part II. Walk into the castle and meet the owner, the current Baron, who will happily tell you all about the villa. Continue to Taormina, a beautiful spot set spectacularly atop a hill. Taormina offers historical attractions, such as the Greek Theatre, used as stage for many important international events, and some great shops. We will have some free time to visit this wonderful small town. You can admire the striking buildings on Corso Umberto, the main road that in the summer evenings is always crowded, and provides wonderful views along the coastline. We head back to the ship for dinner and an overnight sailing to Stromboli. We will arrive early in Siracusa. After breakfast on board we head to Noto, the centre of Sicilian Baroque architecture, a treasure chest brimming with baroque churches and palaces. We will stop on the way at a special cafe to try some special Sicilian sweet - Granita. The cafe is set in what was, in the last century, a nougat factory but is now the laboratory of a famous craftsman. Next we head to a winery set among a spectacular landscape. The beautiful setting of the vinyard set amongst limestone hills, combined with the sea breezes drifting in from 2 different seas help create superb conditions for the vines to grow and to produce some great wines. Here Nero d’Avola and Moscato grow together as well as almonds, carobs and olives. After visiting the ‘Invisible Winery’ and indulging in a little wine tasting, we'll take lunch in one of the of the old wine press cellars or perhaps a picnic of some local delicacies in the shade of carob trees. In the afternoon we will meet a local guide for a short tour of the beautiful old city of Siracusa, and the island of Ortigia, the old centre of Siracusa. The huge Roman amphitheatre was originally constructed around 2000 years ago and is the second largest in Italy. The cathedral and the Archbishop's Palace dominate the beautiful square at the centre of the old town of Ortigia and you can wander the tiny streets, visit some of the historical sites or just enjoy the views and a coffee. Ortigia, the historic centre of Syracusa, is located on an isthmus where a mix of medieval and baroque architecture provide a delightful backdrop to the narrow streets. We will visit Fonte of Arethusa, a 'mythical spring-fed fountain' tied to legend; the Temple of Apollo, a 7th century BC site that was the first great Doric temple and the beautiful baroque Duomo dedicated to St. Lucy who was born and martyred here . We will also visit the “Archaeological Park of Neapolis” (Parco Archeologico della Neapolis) and its huge Greek theatre, that stages theatre performances to this day, the Roman amphitheatre, and a rock cave known as the “Ear of Dionysus” before we head back to the ship. We will sail to Giardi Naxos overnight - You are free to eat on board or try one of the many local restaurants in the evening before we sail to Giardi Naxos. She has ample seating space for moments of relaxation, a mini-library with a variety of books and magazines and modern A/V equipment for presentations. Keep in shape during your cruise at the gym, featuring a variety of fitness equipment. The glass-enclosed dining room seats up to 60 passengers and allows for panoramic views of the stunning scenery you will cruise along. The bar and lounge with an open deck in the back offer an ideal spot for reading,relaxing, or dancing under the stars to the sounds of mesmerizing music. At 223 ft/68 m long, the Monet can accommodate up to 60 guests in 30 double bedded or twin cabins, located on the Camille, Parisian, and Lumiere Decks. Cabins on the Camille and Parisian Decks feature two oversized portholes, while cabins on the Lumiere Deck have large windows. All cabins offer central A/C and ventilation, a mini-bar, flat screen satellite TV, phone system, and hairdryer. The Monet is also equipped with a Wi-Fi internet connection (free of charge). The latest state of the art safety equipment is installed on board and maintained by all 29 trained crew members. The ratio of guest passenger to crew members allows for an exquisite service experience. The restaurant is filled with elegance and the whimsy of fun and bright colors. Sumptuous dining options are provided to entice the palate and compliment the ports of call. Enjoy conversing with fellow guests about adventures had and ahead or spend quality time with your travel partners and discuss the amazing wine. The panoramic views will stun you. The décor is tastefully stated to not over power the elegance of our guests. It is adorned with golds and neutrals. You will shine here. Providing aptly oversized seating to enjoy libations and gathering together with travel companions and new friends. Come here to relax and chat about a perfect end to a day that was filled with incredible sights, sea air and culinary delights. This beautifully appointed accommodation will allow the traveler the opportunity to slumber and wake rejuvenated. Enjoy resting on a double bed, a comfortable desk/vanity, a flat screen satellite TV and a private well-appointed bathroom. The décor is warm and inviting with nostalgic art inspired by M/S Monet’s history in mind. These were specially chosen to provide the utmost relaxing environment. Sleep and relaxation are invited into this space after soaking up the beauty, culture and Adriatic air. This delightfully appointed cabin allows travelers to sleep and have quiet time that salt air and sea travel induces. Rest peacefully on twin ample mattresses, a comfortable desk/vanity, a flat screen satellite TV and a private well-appointed bathroom. The décor is bright and cheery with pleasant tones. You will dream well here and be rested for yet more adventures and epicurean travels. The deck is designed with pure enjoyment and service in mind. It is a bright and warm environment. You will find the classic detail of teak furniture to be the ideal seating area for reading, relaxing, dining or enjoying fine wine. The bar and lounge of the Open Deck permit the coast to be in sight as you dance and enjoy the company of fellow travelers. The seas reflect and shimmer as you partake in a true experience of traveling on a classic yacht. Relax on the Sun Deck and soak up the sun of the Adriatic Sea with outstanding and uncompromised views. The nautical experience of the open air accomplishes relaxation, tranquility and the true ambience of the coast. 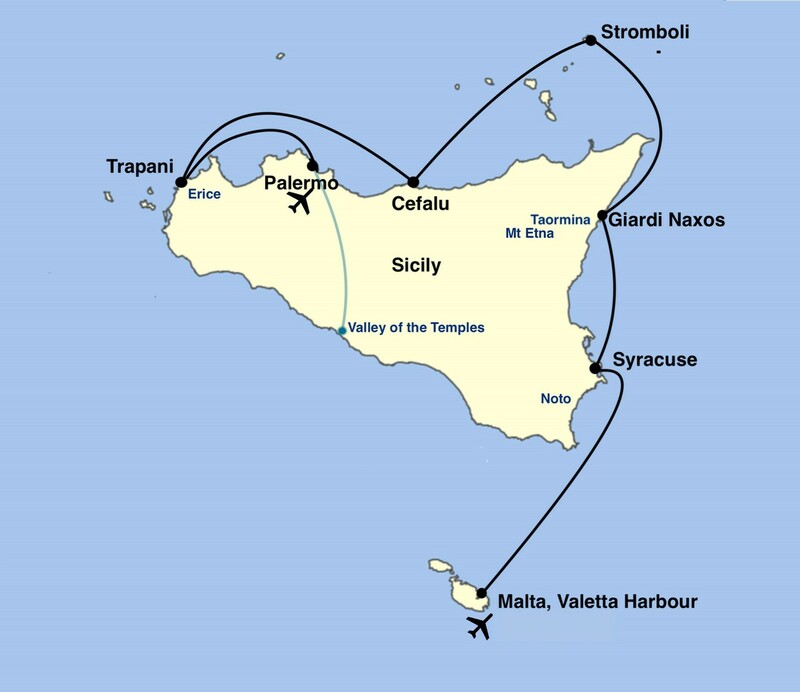 15% off Sicily cruise in September 2019 or NO SINGLE SUPPLEMENT FOR SINGLE PASSENGERS. Only applies to new bookings, cannot be combined with any other special offer. Next departure on 21 September, 2019. Welcome aboard for this memorable journey as we cruise from Dubrovnik to Venice. As we travel through these amazing destinations you will see some magnificent scenery and (hopefully) some dazzling ......click here to read more. Sicily is one of earth's most spectacular and interesting islands. Settled by Greeks, Romans, Arabs, Normans, Carthaginians and many others, with rugged mountains dominated by Mount Etna, Europe's most active ......click here to read more.